Every year, the construction industry is responsible for causing deaths and serious injury. The industry has done much to improve its performance which I welcome, but there is still room for improvement. Our industry is innovative and equipment is constantly evolving and developing so that construction processes can become increasingly efficient. This has consequences for site management who must ensure that operators are competent, capable of operating equipment safely and are following safe working procedures. A mobile elevating work platform (often referred to as a MEWP) saves time and makes work at height efficient, effective and safer than using traditional methods of access. When used safely, MEWPs significantly reduce the risk of injuries through falling from height. Unfortunately over the past few years a significant number of accidents involving the use of MEWPs have occurred, including tragically fatalities. Some of these incidents have involved the operator or other person being crushed against fixtures or other obstacles while accessing their work area, or while working at height. The incidents could have been prevented by correct planning and preparation, selection of appropriate machinery and proper use. In addition to the terrible cost in human suffering, accidents have a financial cost. There is a very strong business case for improving safety performance. 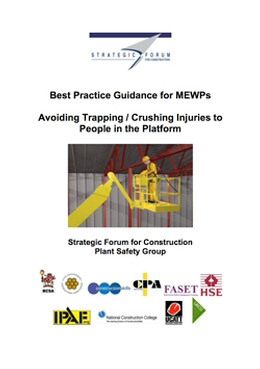 This guidance has been prepared by the industry to provide clarity about the safe use of MEWPs including planning, equipment selection, and training, provision of information, familiarization, safe use, supervision and rehearsal of rescue procedures, together with monitoring of the whole process. The guidance is straightforward, comprehensive and easy to adopt. It represents best practice. I would particularly like to thank those involved in its preparation and commend the guidance to anyone who owns, supplies or controls the operation of MEWPs. Please read the publication and turn the advice into action.